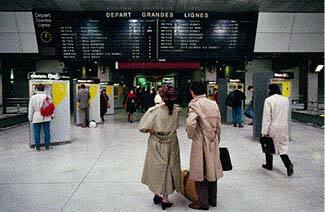 ABOVE: If you miss your train, consider yourself lucky: You can spend another day in Paris. In 2009, an estimated 14.4 million visitors stayed in Paris hotels, and nearly 8 million of those travelers came from outside France. However, the average hotel stay by a foreigner was only 2.7 nights--which means the typical traveler from abroad had only about two days for sightseeing, dining, shopping, and other activities after subtracting the time needed for arrival and departure. That's a shockingly brief amount of time to spend in the world's most popular tourist city. We recommend staying a minimum of a week, and preferably longer. By spending a week or more in Paris, you'll have a chance to become familar with the city and its neighborhoods. After all, there's a lot more to Paris than the Eiffel Tower, the Louvre, and the Cathedral of Notre Dame. Look for ways to extend your stay in Paris, either by simplifying your travel itinerary (if you're visiting more than one city) or by postponing your visit until you can devote more than two or three days to the French capital. If you race into town and leave 48 hours later, you'll almost certainly regret that you didn't stay longer. 2nd inset photo copyright © Linda Steward.